No Sew Ribbon Christmas Tree Skirt!!! I’ve been seeing so many cute Christmas Tree Skirts everywhere, I even featured The Crafty Blog Stalker’s No Sew Ruffle Tree Skirt a few weeks ago on From Dream To Reality. Our Christmas tree is going to be very bright this year and so I figured it will need a new tree skirt that will fit the new colors. I was searching for fabric to make my own, however no luck finding what I wanted. One day I was at Walmart in the Christmas section and came across some gorgeous decorative ribbon. When I saw them, I told myself ”Gosh, I wish I could find fabric like that”… and then walked away. As I’m in the next row… it dawn’s on me… ”Wait a minute… I could use ribbon instead of fabric!! It would save me from needing to cut strips! !” GENIUS!! So I grabbed all the ribbon I liked (2.5” wide) and went on my merry way. When I got home I pulled out one of my old tree skirts, which was bright red. I figured since I hadn’t used it in years, why not just hot glue the ribbon onto that! I sat down and started unrolling my ribbon… and then I noticed something… the ribbon was sheer ribbon… which meant I could not hot glue it onto the red tree skirt because you would see the red through it… DARN!! I pulled out my fabric bin and came across a light pink minky dot fabric I had. I figured it was better to see pink through the ribbon than red. I was planning on putting ribbon all the way up the skirt, but once I got started I noticed that the combination of ribbon and that pink fabric looked AMAZING together… and because of that.. I did not put the ribbon all the way up! 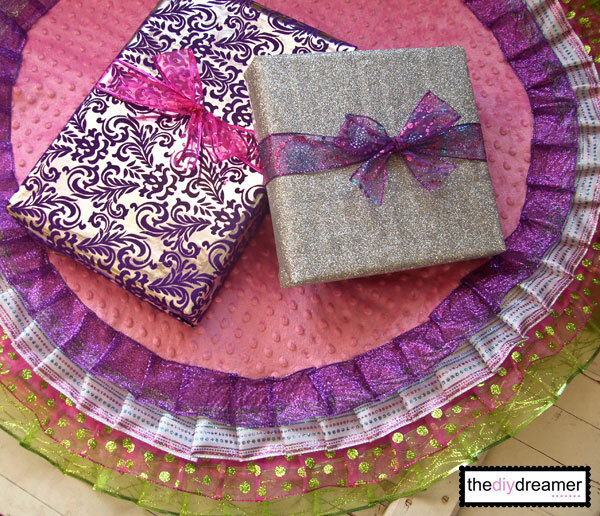 This is how I made this SUPER easy NO SEW Ribbon Christmas Tree Skirt. This post contains some affiliate links (which means if you make a purchase after clicking a link I will earn a small commission which helps keep my blog up and running but it won’t cost you a penny more). Click here to read my full disclosure policy. Step 1: Place the old tree skirt on top of the fabric. Step 2: Pin the fabric and the old tree skirt together. Step 3: Cut the fabric around the skirt leaving about 1” – 1.5” of fabric on the sides. 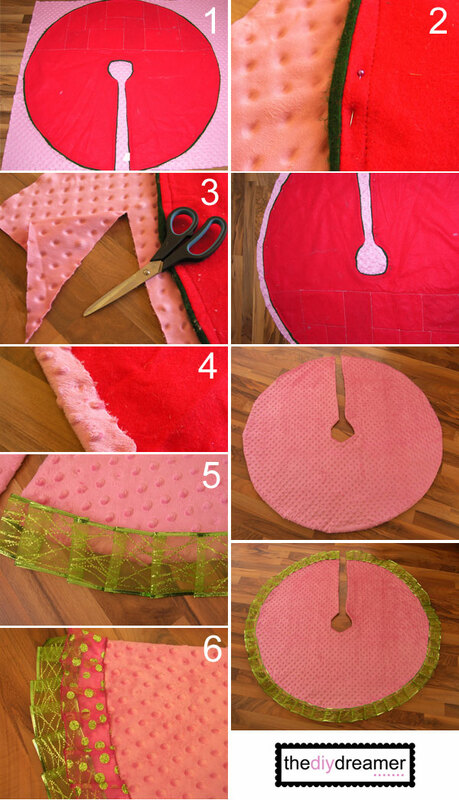 Step 4: Use heat bond and iron to attach your fabric onto the old tree skirt (using the 1”-1.5” fabric on the sides). Step 5: Hot glue the top edge of your decorative ribbon onto the tree skirt. Continue doing this while you fold over your ribbon to give it a ruffle look until you have gone around the whole skirt. Step 6: Repeat Step 5 with the next ribbon by placing it just a bit higher than the previous ribbon (overlap it). Keep repeating this step until you are finished with all your ribbon. 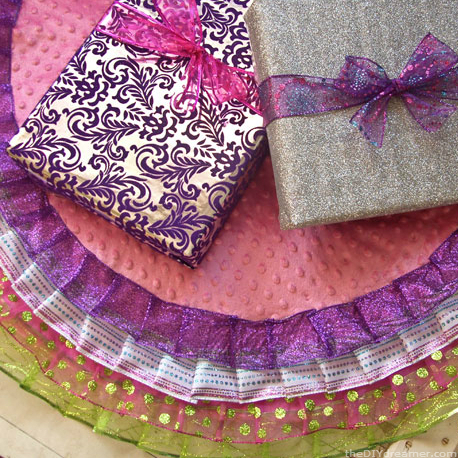 And voilà.. you have yourself a gorgeous custom made ribbon tree skirt!! I can’t wait to see how it looks when the tree is all setup!! P.S. I’m linking at these Parties. It looks fabulous! So fun! Best new Xmas idea I’ve seen in forever!! This is the greatest idea ever, and will make the project so much easier than the other tutorials I’ve seen. I absolutely LOVE the colors and how it turned out. Confession: I’ve actually been using one of those ratty Walmart fuzzy red skirts for the last 2 years, so it’s beyond time to trash it. I’ve got to try this and am so glad you shared. Love your creativity girl-you rock! LOVE THIS! I’m not much of a sewer so this is fantastic! Thanks for sharing! That is so cute! I am your newest follower and was hoping that you would follow me back! Oh my goodness this is super cute, so is the rest of your blog too! I’m a new follower via Twitter. I came across your blog on the Sunday Funday link up. I hope your having a great Weekend. Christine this is not only fabulous, but it’s stunningly beautiful! I love it. I don’t have a tree skirt, but I might this year now! Awesome project! How pretty! I would have never thought of doing this! Looks great! That is so pretty. I love that it’s an easy and homemade. What a great idea. Beautiful job Christine! I want one too! I love no sew crafts! Hot glue is awesome!! ;) Your tree skirt is so pretty!! 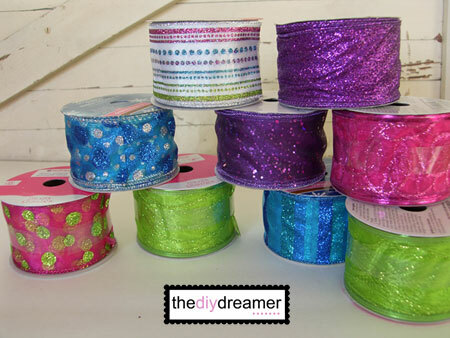 Visiting from the Creative Me Linky Party! Christine, you tree skirt came out so cute. You are braver then I am with all that ribbon. I just hot glued some ribbon for a craft I’m blogging about soon and burnt the daylights out of my fingers. Stop on over and visit, starting Saturday I’m have a blog social hop and would love for you to join. What a clever idea! Love it! Thanks for sharing. I’m visiting from Fancy This Friday over at Truly Lovely. This is cute. Thanks for sharing. How would life be without hot glue….??? Love the bright colors together! SO pretty and great tutorial!! Featuring you at tomorrow’s party! THANKS so much Christine for sharing! I am in desperate need of a cute tree skirt, and I can never find one in stores that I like, or that match my tree’s style, and this thing would be fantastic! I am going to have to make this!! I’m pinning this to my Christmas board and am now following you! So, so, fun!! I’ve been needing to make a new tree skirt too, and I think I’ll use this format…I can’t wait to get some ribbon!! Oh my, how lovely! I love things that don’t need sewing! This is such an awesome Christmas craft! Thanks for sharing!! Thanks so much for sharing at Wednesday’s Adorned From Above Blog Hop. This weeks party is live. I hope to see you there. You’ve gotten a lot of well-deserved positive feedback, and I just want to say I love your tree skirt too! Well done! Beautiful! Right now we just use an old table cloth that we lovingly wrap around the bottom of our tree. You have inspired me! Very nice! You are a genius! As I put out our tree skirt this year, I realized I was really ready for a change. If I get time, I might try to do this to it this year. I’m going to feature this on my Weekend Wonders round up tonight. “No Sew,” my two favorite words in association with crafts! This looks amazing. That skirt is DARLING!!! I love the fun colors! How creative that the ruffles are made from ribbon! Thanks so much for sharing at Thursday’s Temptation. 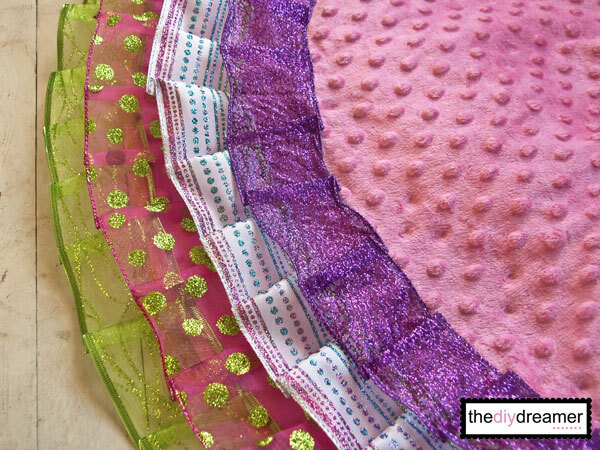 I am going to be featuring your tree skirt tonight on my blog! What a great project Christine. I love the color. It is such a fun non-traditional twist. You had me at “no sew”! It’s so cute and fun. What a great idea! Wonderful idea! Especially love the ribbon ruffles! Great idea for not having to sew it! I’ve been using the same patchwork one that my mom gave me when I moved out that is terribly stained, but I have such fond memories of it, I can’t bare to give it up. This is beautiful! This is my first year having a tree, so bring on the ribbon! Thanks for linking up to Take-A-Look Tuesday over at Sugar Bee Crafts – you were featured today! This is beautiful and perfect for me since I don’t sew that much! I’m featuring it today. You had me at no sew:) Love the colors you chose, I bet your tree was fantastic! I have lots of ribbon. Can’t wait to try this idea for other things too. I love this tree skirt! Thank you for sharing it. Awesome.. I never knew something like heat bond existed..